This photo is from 2013’s Kentucky Crafted: The Market, a snapshot of Art Mize’s work space where he talked with attendees about his work as a luthier, a maker of stringed instruments. Mize was the 2007 recipient of the Homer Ledford Award. 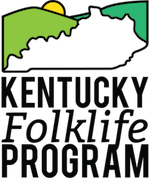 This year, the Kentucky Folklife Program along with the Kentucky Arts Council will present the 2017 winner, Doug Naselroad, with the award on Saturday, April 22. KFP, along with WKU Folk Studies students and Dr. Tim Evans will also be helping to interpret traditional artists during hands-on educational activities. The Market runs 4/21-4/23 and is held at the Lexington Convention Center. For more information, click The Market’s page on the Kentucky Arts Council website.